Designed with the plant-based compound resveratrol, found in grapes, that may reduce the risk for heart disease and diabetes mellitus. 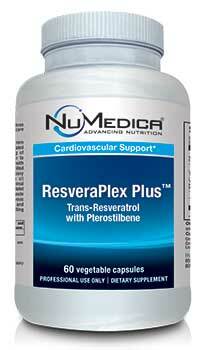 NuMedica ResveraPlex Plus is formulated with resveratrol to provide advanced cardiovascular support. Resveratrol is a natural plant-based compound found in foods like grapes that may have the ability to improve cardiovascular health and help the body ward off heart disease. 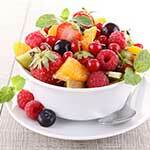 Its powerful antioxidant effects may also benefit the body in many other healthful ways. 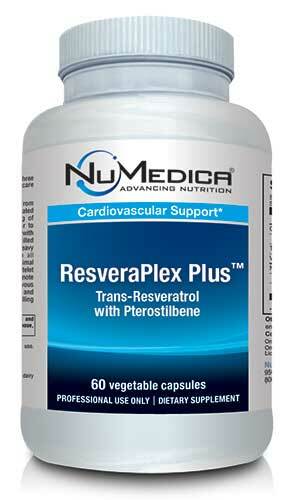 NuMedica ResveraPlex Plus is designed with potent resveratrol that has been linked to many health benefits. Preliminary studies have indicated that this compound found in the skins of grapes, for example, has anti-inflammatory effects. Inflammation is associated with disease. By warding it off along with the free radicals that cause it, you can more effectively protect your overall health. Many scientists are particularly interested in resveratrol for its ability to enhance heart health. According to research, resveratrol may be able to help reduce harmful LDL cholesterol in the blood where it can lead to a hardening of the arteries. It may also be able to help ward off hypertension and reduce cell adhesion, which makes it more difficult for plaque to build up in the arteries where it can block vital blood flow. Other research involving resveratrol is focused on its potential anti-cancer effects and its ability to reduce the risks for obesity. It may even be able to reduce insulin sensitivity, which may decrease the risk for diabetes mellitus. Research also shows that resveratrol can contribute to more youthful looking skin and increased longevity with its anti-aging properties. You can make resveratrol part of your healthy lifestyle by taking a NuMedica ResveraPlex Plus. With its natural ingredients, this supplement can enhance heart health and may provide other healthful benefits as well. Other Ingredients: Cellulose (capsule), cellulose powder, stearic acid (vegetable source), silica. Not Manufactured With: Wheat, gluten, soy, milk, eggs, fish, shellfish, tree nuts, peanuts.